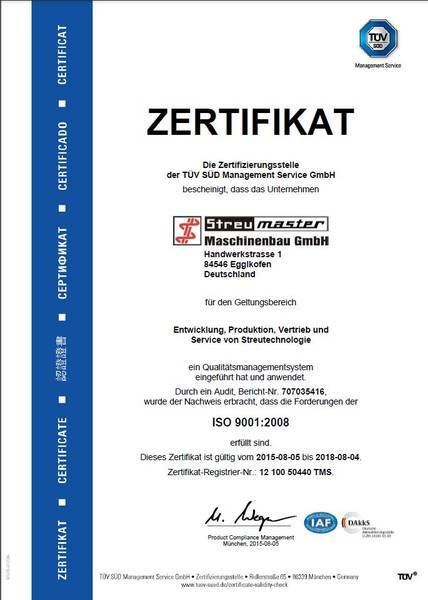 August 2015: STREUMASTER is ISO 9001 certified! The company STREUMASTER has been successfully ISO certified in August, 2015. This is an award for the existing qualtity management at STREUMASTER. We elaborated a quality management system in order to continually increase the quality of our products, from which all interest parties benefit. STREUMASTER constantly guarantee their customers products and services on the highest quality level. The award reflects the company's focus on the high customer satisfaction, paticularly by a quality philosophy based on permanent improvement of our products. The certificate has been granted by the renowned certification authority TÜV-SÜD, Germany, for the sectors Development, Production, Sales and Service.